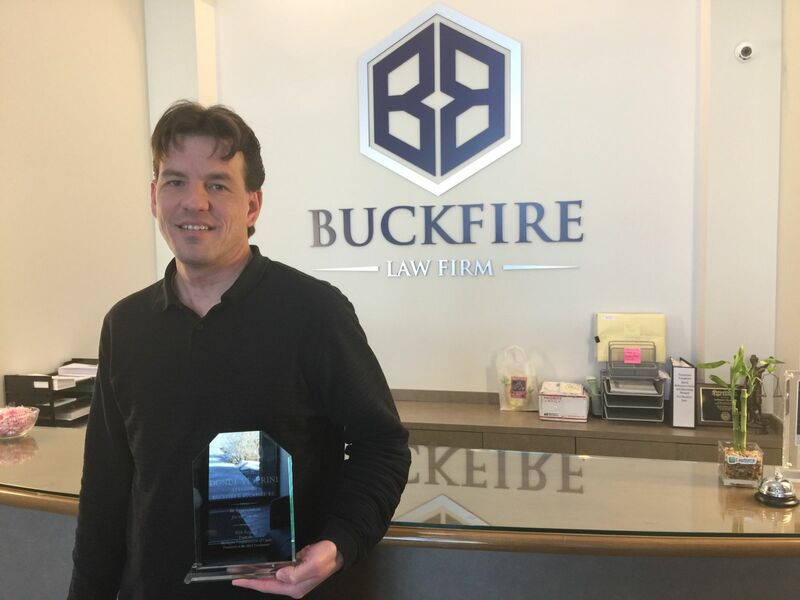 SOUTH LYON, Mich. -- Buckfire Law motorcycle accident lawyer Dondi Vesprini was recently recognized by the Michigan Confederation of Clubs for his exceptional work done on behalf of the MCOC. A highly respected attorney within the Michigan motorcycle community, Vesprini accepted the plaque of appreciation in late January at the MCOC's annual fundraiser in Detroit. He was presented the honor by MCOC Chairman Lil John and Vice Chairman Russell Cockerham. Vesprini, who has been working with member clubs of the MCOC since 2000, was named the attorney for the MCOC by the MCOC board in 2012. Since his initial involvement with the MCOC, Vesprini has represented various members in a variety of legal matters, including motorcycle helmet hearings, cases involving civil rights violations and motorcycle accident cases. "It's an honor and privilege to be recognized by the Michigan Confederation of Clubs," Vesprini said. "The MCOC provides a voice and education on how to protect the rights and safety of bikers, and I'm proud to help their cause." Vesprini has also assisted member clubs with issues, such as trademarking patches and registering their insignias. More recently, he was active in Lansing, Mich. meeting with various legislators and the Governor’s office to advocate regarding legislation that impacts motorcyclists, including no-fault reform. The Michigan Confederation of Clubs (MCOC) is a statewide motorcycle organization comprised of over 60 motorcycle clubs dedicated to preserving the rights of motorcyclists across the State of Michigan. The Confederation works legislatively and in the community to protect and preserve the freedoms of their right to ride, to promote motorcycle awareness and safety, and to prevent profiling, discrimination and violation of their civil liberties as motorcyclists. Vesprini earned his Bachelor of Arts degree in Psychology in 1996 from Oakland University with a minor in Sociology. He earned his Juris Doctor degree in 1999 from the University of Detroit – Mercy School of Law where he was on the Moot Court Board of Directors, represented the law school in national moot court competition, and was a member of the St. Thomas More Society. Vesprini is admitted to practice law in the State of Michigan, the United States District Court of the Eastern District of Michigan, the United States District Court for the Western District of Michigan, and the United States Court of Appeals for the Sixth Circuit in Cincinnati, Ohio. Vesprini's advocacy extends beyond the court room as he proposes legislation and meets with the Governor’s office, legislators and lobbyists regarding legislation affecting injured motorcyclists and non-motorcyclists alike, including but not limited to the Michigan motorcycle helmet law and fighting to preserve Michigan’s No Fault system and the benefits it provides to injured people. Buckfire & Buckfire, P.C. is a top-rated Michigan personal injury and motorcycle accident law firm. Founded in 1969 by David Buckfire (1934-2012), Buckfire Law has earned the highest possible ratings in the legal profession for skill and integrity. Buckfire & Buckfire, P.C. attorneys have achieved tremendous success in the courtroom and have won some of the top jury verdicts and settlements in the State of Michigan. You can afford to have the best Michigan personal injury attorneys on your side for your motorcycle accident lawsuit. It costs you nothing to get started and we will even pay to open the probate estate. If your case is unsuccessful, you owe us nothing. No money to get started or to open the probate estate. No legal fees whatsoever unless the case settles. Chat online with our intake specialist and a motorcycle accident lawyer will call you directly. Warning: There are strict time deadlines for filing Michigan motorcycle accident lawsuits. Call to learn more about Michigan motorycyle accident lawsuits and settlements.